Pre-approval shows that you have the resources to make a purchase when you find the perfect home. From the sellers’ point of view, a pre-approved buyer is more attractive. Download and complete the form for a speedy pre-approval. 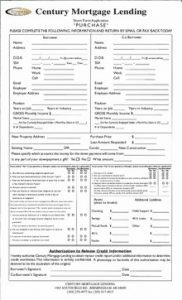 print and hand-fill the form. or print and scan, then return. By proving you have lenders backing you, your mortgage pre-approval could help you negotiate on price — it may also be a deciding factor for sellers who receive multiple bids. Pre-approval involves requesting a copy of your credit history and an examination of your application information and the documents you provide. This will show as an inquiry on your credit report. Because pre-approvals are only good for a certain amount of time, we recommend that you apply for a pre-approval when you are fairly certain you’ll buy a home within the next 90 days.